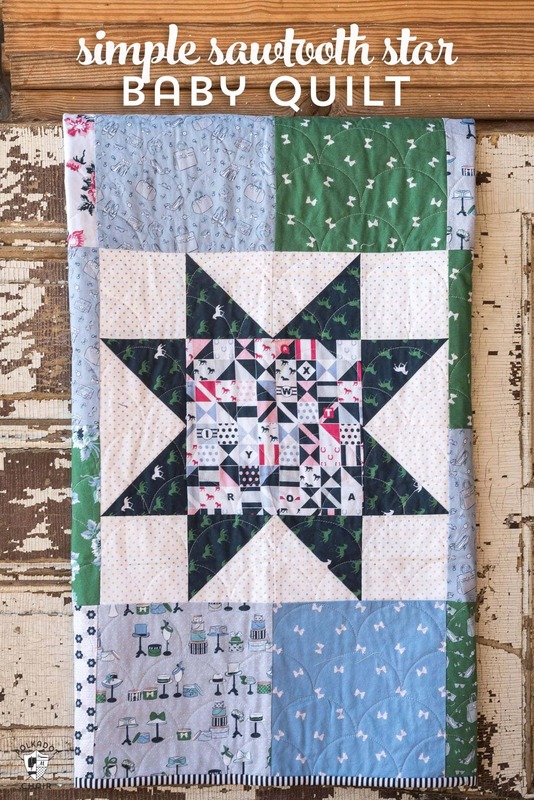 This Sawtooth Star Baby Quilt is so easy to stitch up that you’ll want to make more than one! 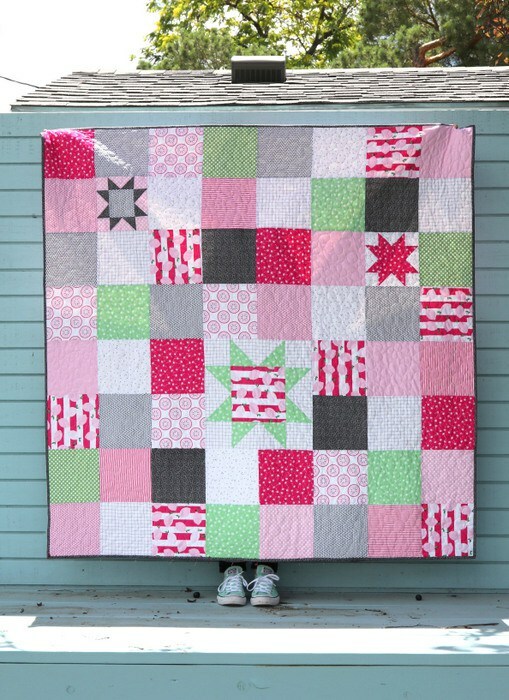 It’s a great quilt project for a beginning quilter. 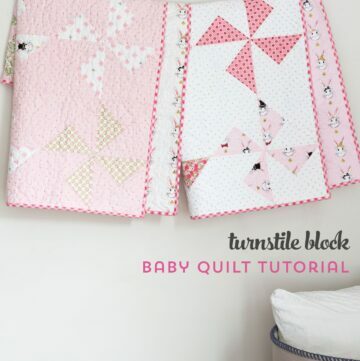 If you like this pattern, you may also like this Turnstile Baby Quilt Tutorial. 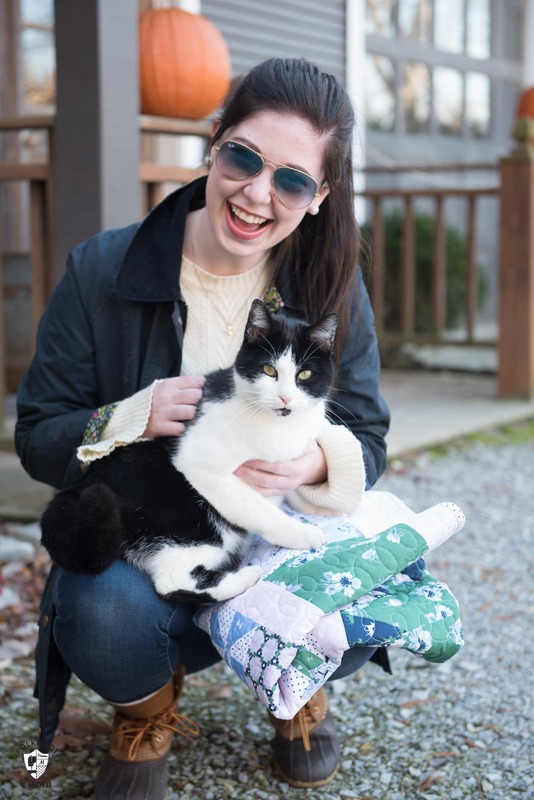 I was going to wait to chat about this quilt until after the Holidays. 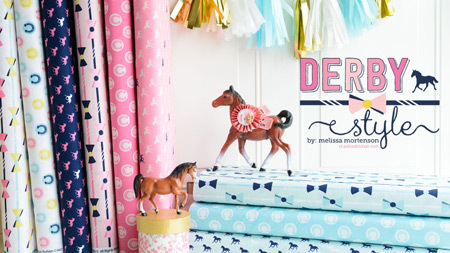 It features my Derby Day line of fabrics which won’t hit stores until February of next year. 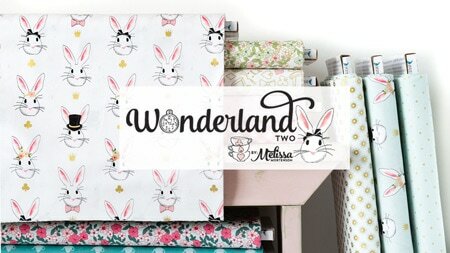 I know that it can be confusing seeing fabric online and keeping track of when you can buy them. So I usually try to avoid sharing stuff too early because of that. I decided, however, to make an exception with this quilt. I started thinking that some of you guys might be looking for SIMPLE quilts to stitch up for Christmas gifts and thought that this one would be perfect. It’s so stinkin’ easy to make and you can customize it to meet your needs. 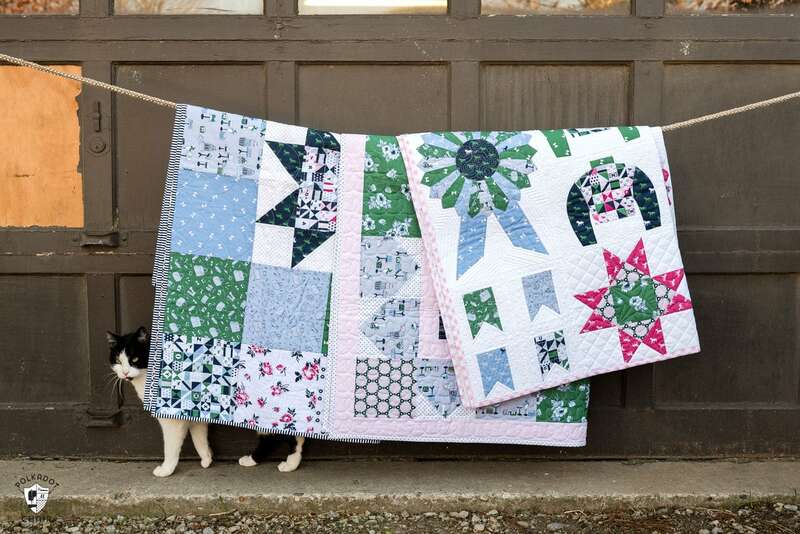 Okay, first up, this is not my quilt tutorial. So if you’re thinking you’ve seen it before you have. 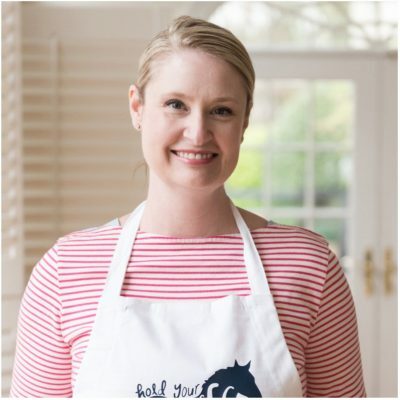 It’s actually a tutorial from Amy Smart of Diary of a Quilter. 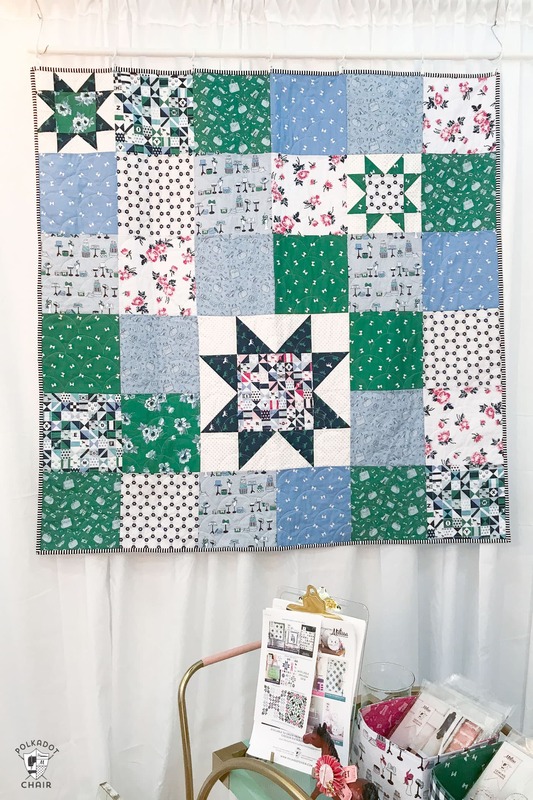 I was searching for a simple to stitch up quilt for my booth at market last Fall and I immediately thought of this tutorial. She stitched it up last summer and I fell in love with it as soon as I saw it. 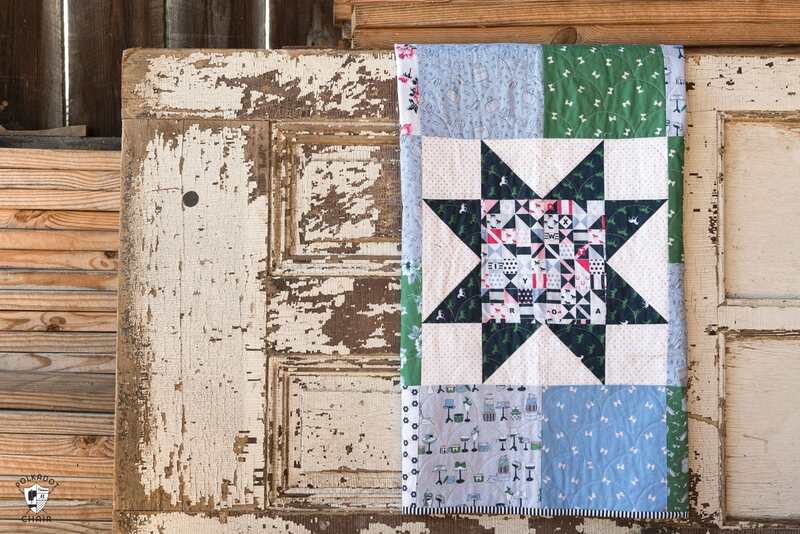 It’s a simple take on a sawtooth star quilt crossed with a patchwork quilt and is a great pattern to use if you’re looking to show off some of your favorite fabric prints. You can CLICK HERE for Amy’s Tutorial. I made a few changes to my quilt. Instead of the 8 rows of 8 that Amy chose, I shrunk mine to 6 rows of 6. It’s a quilt that I think is best as a square quilt. My quilt when finished it was approximately 48″ x 48″, which is a great size for a baby quilt. 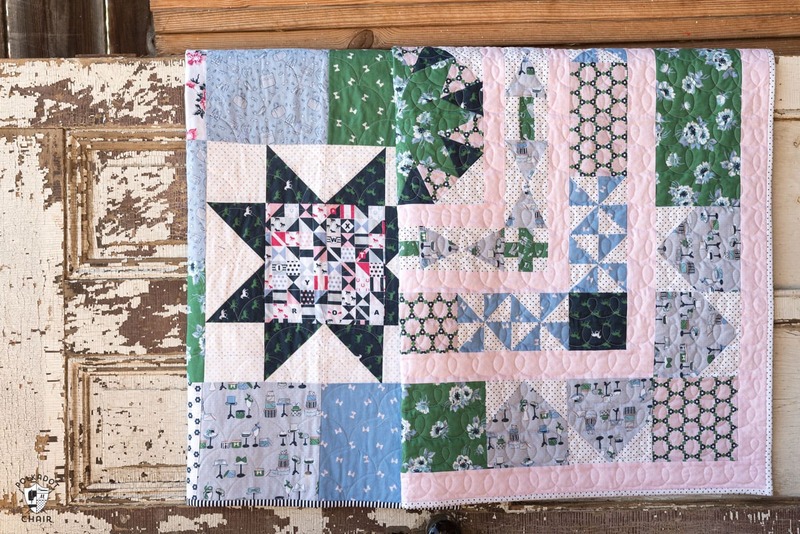 I like Amy, interspersed 3 sawtooth stars into my quilt to break up all of the patchwork. I stuck to blues and greens for the color scheme. 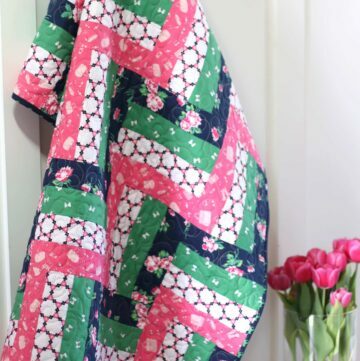 (In her post she shares some great tips for picking fabrics for a quilt as well). Here it is hanging in my booth at Market in Houston. 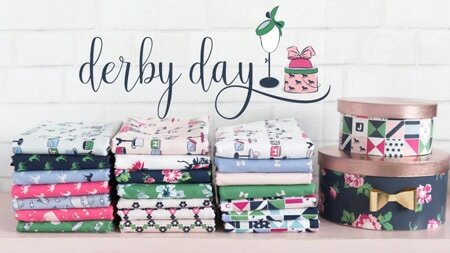 Derby Day will be my 5th fabric line with Riley Blake. I think it has taken me this long to figure out what in the world I’m doing. One of the hardest parts of designing fabric is having all of your projects and photos ready when the fabric is released! I don’t get fabric until a few weeks before everyone else, so as you can imagine it’s a bit of a mad dash to get it all put together. This time, I was able to get my hands on some advanced, advanced yardage. Which was AWESOME. 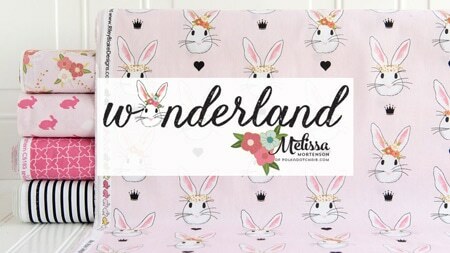 It varies slightly from the finished fabrics (you can’t put metallic ink on advanced yardage, and the colors are slightly different, in this case, they were darker), but it’s worth it to get fabric earlier. Since I’m a bit ahead, I thought that I’d take advantage of a sunny day and take some of my quilts to a friends farm to photograph. She was nice enough to let me come out and traipse around a bit. She even brought out a few horses to pose for photos! When she asked if I wanted photos with a horse I did a happy dance. I mean look at that gorgeous creature. He’s a Fresian and I’m pretty sure belongs to a friend of hers in the same barn. My daughter is home from college for Thanksgiving, and let’s just say that I didn’t have to ask her twice to jump in the photos. She fell in love with this horse right away. There were also cats and dogs roaming around the farm, including the cutest golden retriever. With all of the horses and animals, I thought I’d never get her to leave (I really didn’t want to leave myself)! So back to the quilts. 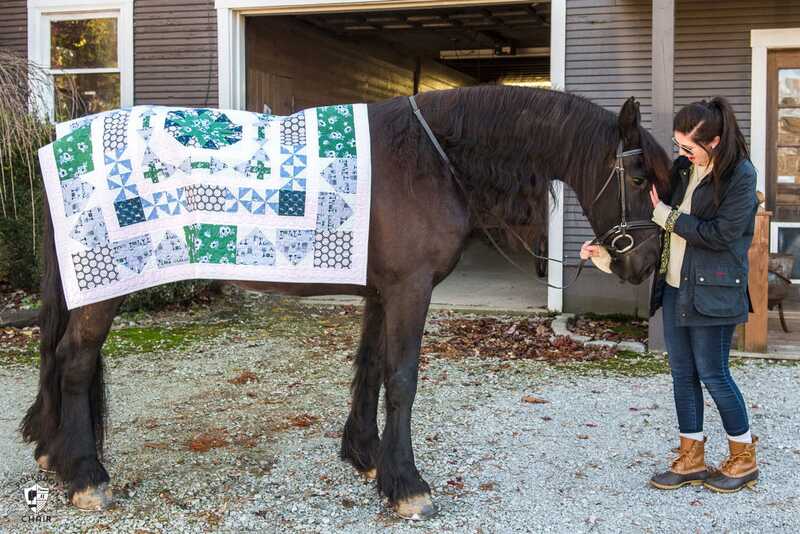 The quilt on the horse above was made by Erin Harris. It’s a project from her book Make your Own Medallion (affiliate link), coming out in the new year. When it gets closer to the book’s release, she’ll share more info about the quilt. The 3rd quilt in the photo above is a new pattern due to arrive early next year. 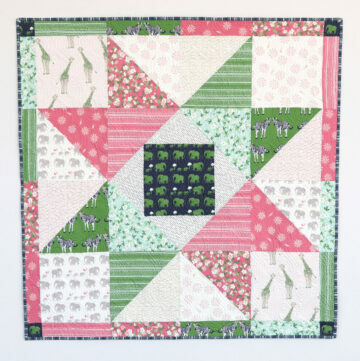 It’s called the Derby Sampler and I think might be one of my quilts that I’ve ever made. It will be available in print and PDF format, and I’ll be sure to share with you more when the time is right. I ended up taking so many photos that day at the farm, I’m still sorting through them all. 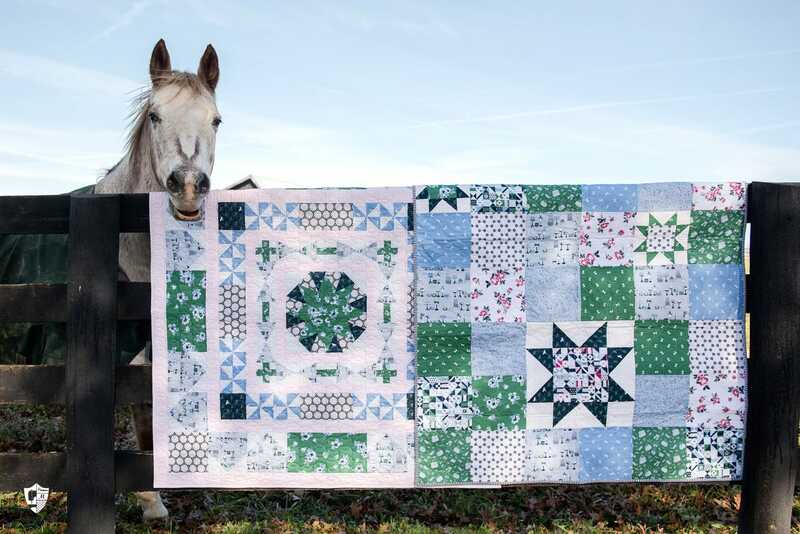 I have one more quilt that I am working on before the Derby fabric release in February. I’m really excited about how it is turning out and I think another trip to the farm will be called for when it’s done! I always love what you creates, outstanding quilts. The two horses and cat is adorable to. Your horse and kitty shot photos are super-duper. The quilts, as well, of course. But, gotta say, the beautiful horses and kitty make it all terrific. Will definitely make the quilt. Thanks! By the way, would love to see the golden retriever ! 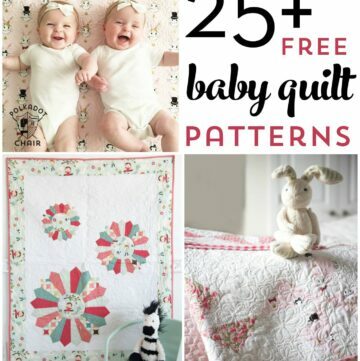 Where can I find the pattern for your changes to the Sawtooth Star baby quilt? I went to Amy’s site but only the original pattern is there. I really like the changes you made. It’s exactly the same as hers except she made hers 8×8 and I made mine 6×6. I just didn’t have enough fabric to make mine as large as hers. All of the block measurements are identical.